What Does Draw Mean on a Calloway Golf Club? Phil Mickelson won the 2006 Masters while using a Callaway draw driver. A draw is a controlled golf shot that moves from right to left, for a right-handed player. There are certain situations in which hitting a draw is strategically beneficial to help place the ball in a desired location. Additionally, some players are more comfortable hitting draws regularly, while others hit draws as a way to avoid slicing the ball. When Ely Callaway bought a half share of the golf club manufacturer Hickory Stick USA in 1982, woods were still made of wood, and Callaway was known to personally deliver clubs to customers. It wasn’t long before the renamed Callaway Golf Co. became one of the biggest names in the industry. As of 2011, Callaway’s annual sales were approximately $1 billion. Draw clubs work in one of two ways. Some clubs simply angle the club head into a slightly more closed position. In other words, for a right-handed player the club head is angled a bit more to the left when you address the ball. The other method is to add weight to the heel side of the club head. With additional weight near the club’s shaft, the toe can square up easier during the downswing, eliminating the open club face that may cause a slice. As of 2012, Callaway manufactures both types of draw clubs. The company manufactures drivers, fairway woods and hybrids with adjustable hosels that can close the club head’s face angle. Additionally, Callaway sells drivers that include removable weights. By adding or subtracting weight in different areas of the club head, the player can essentially create his own draw club. 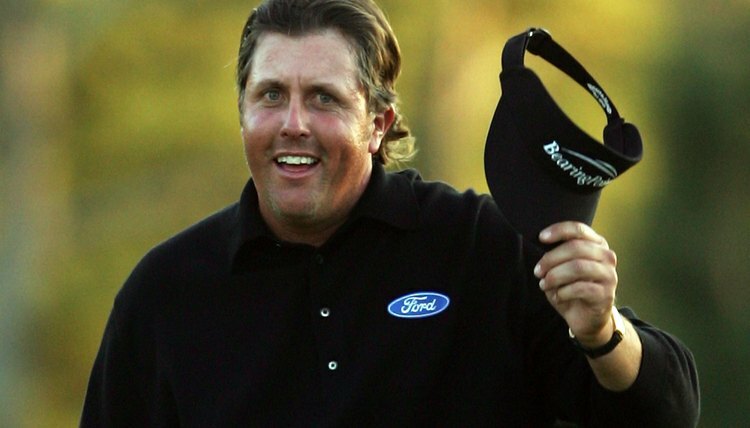 Phil Mickelson kept two Callaway drivers in his bag while winning the 2006 Masters. One contained extra weight in the heel to promote a draw. There may be occasions during a round where you wish to hit a draw. A dogleg hole that angles to the left, or a green with a hole location on the far left side, are two situations that may call for a draw (for a right-handed golfer). If you don’t wish to purchase a draw club, you can prepare for these situations by learning to play a draw with a neutral club. Golf writer Steve Newell suggests aligning your body to the right of the target, but aiming the clubface at the target. This setup should result in putting spin on the ball, curving it from right to left. In addition to body and club alignment, Jack Nicklaus says, golfers who play a draw must keep the right shoulder lower than the left through impact while the right hand rolls over the left at the same time. What Is the Difference Between Right & Left Hand Golf Clubs?